The first month of Facebook Timeline for Pages has been a learning experience for all and a very frustrating experience for some. Some bugs and imperfections should always be expected during the initial days and weeks of a launch, and Facebook Timeline has certainly followed that rule. Sometimes, it’s simply a matter of understanding how to use Timeline. In those cases, I can help. In others, there is a technical problem that I can’t do anything about. In these cases, you need to be vigilant. This is how to contact Facebook so that you can let them know about your problem. Next to the Message button on your page’s Timeline, there is a drop-down menu. Click it to get access to Send Feedback. 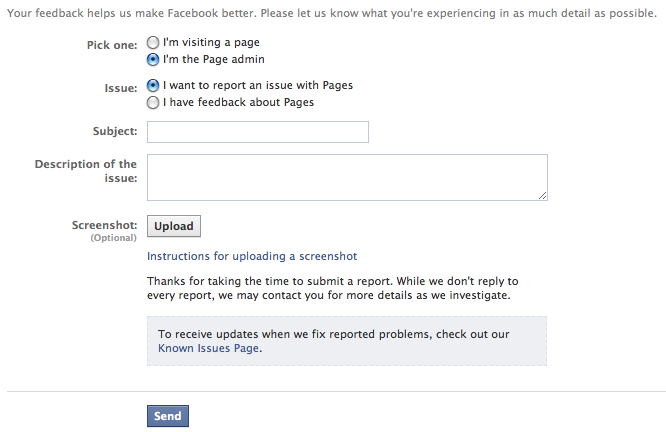 If the problem is with your Page, select I’m the Page Admin and I want to report an issue with Pages. Now, you shouldn’t stop with sending feedback just when you see a bug. 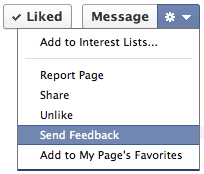 Contact Facebook about things you don’t like and things that you want to be improved. Don’t just complain to your friends and co-workers about the new Timeline for Pages. Do something about it. If there’s one bug or improvement you could ask Facebook to make, what would it be?